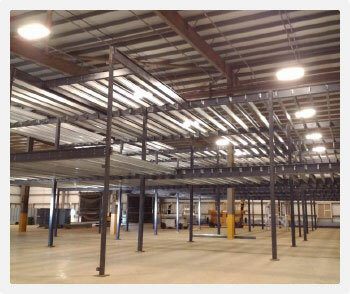 Mezzanine storage solutions have the ability to almost double your available floor space, offering an extra level to your warehouse, factory or storage facility, so you can enhance your storage and production capacity. Our expert team will provide a site survey to assess your requirements, designing a freestanding mezzanine storage floor that meets your needs and fits perfectly into your existing layout and space. Following the design and production, installation is quick and efficient as it does not require any structural support from the building, and you can increase space without the cost of relocating. All necessary staircases, handrails, gates and lifts are installed to provide efficient use and to ensure that your new structure meets building and health and safety regulations. For more information about our mezzanine storage and production solutions, simply get in touch with the team at Stodec Products today.